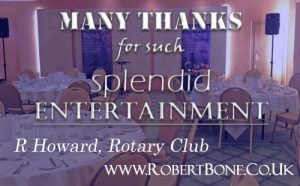 On the evening of Wednesday 27th April I have the pleasure of entertaining at the Rotary Club annual dinner at the Regency Park Hotel in Thatcham, near Newbury, Berkshire. After a month of traveling what feels like the length and breadth of the UK it was nice to be working at an event a ten minute drive from my front door! It was a combined dinner for three local Rotary Clubs: Thatcham, Newbury and Hungerford. I started with come close-up magic at the drinks reception as members and guests arrived. The great thing with this style is it brings groups that don’t know each other together as they experience the magic (which in turn gives them a talking point) with people asking, “do you mind if we watch?” to which I replied, “the more the merrier” as everyone got involved. I continued the close-up magic around the tables once everyone was called through to dine, entertaining between the courses. People were now sitting with different people to who they’d been talking with at the drinks reception so this was a good opportunity to layer on experiences. Once the desserts were finished and tea was served I performed a 20 minute mind-reading cabaret show for the whole group. Whereas I performed sleight of hand when doing the close-up around the tables, the show worked as a continuation and united the audience. Members of the audience were randomly selected through-out, and various minds were read, merely thought of objects were drawn and finished with a prediction that stunned the audience. Many thanks for coming along to last night’s Rotary dinner and providing such splendid entertainment. It was very well received and everyone enjoyed the evening. 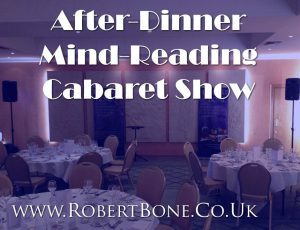 If you would like to find out more about my close-up magic and cabaret show please drop me an email (robert@robertbone.co.uk) and we can discuss how I can provide an evening of magical entertainment for your club or society annual dinner.